Last Saturday night L. and I were strolling in Seattle's Queen Anne district after a lovely dinner at one of those little white Christmas light / white tablecloth restaurants and we stopped for a cup of hot chocolate from Chocopolis. 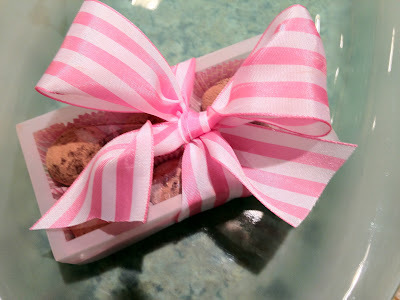 It was such a delicious chocolate moment that I wanted to try my own chocolate treat for L. I decided on espresso truffles. They're fairly easy to make but they look like they came from a chocolate shop. Heat the whipping cream in a pan over low to medium heat stirring often. Do not let it boil. Once the whipping cream is warm, add the instant espresso. When combined, slowly add the cream/coffee mixture to the chocolate/butter until the mixture is combined. This is a ganache. Pour the ganache into a glass or metal pan (8 by 8 works well) and freeze for one hour. Removed ganache from freezer. It should be hard to the touch with a little resistance. After washing your hands in cold water (this helps with the next part) pat hands with cocoa powder. Using a teaspoon (the compact kind from a measuring spoon set is perfect) scoop a ball of ganache. Roll the ball of ganache quickly in your hands to form a ball. You'll want to do this as quickly as possible because the heat from your hands will begin melting the chocolate. The cocoa powder on your hands will help you roll the balls without them sticking to your palms. The ball should be about 1 inch in size. 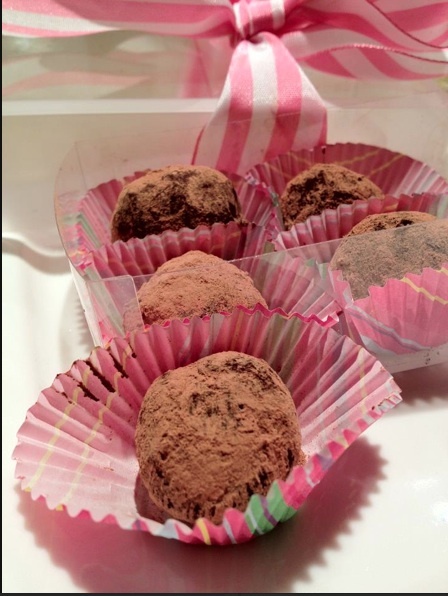 Roll the ball in the cocoa powder until the whole truffle is covered in cocoa powder. Set each one in the candy wrapper. Repeat with the rest of the ganache. You've made truffles! Store them in a closed container in a cool place. They will keep for up to 2 weeks.